Sealants: What You Need to Know? Enamel coating on newly erupted permanent teeth of your child takes time to become strong enough. Thus children’s teeth are more vulnerable to cavity formation. That is why fluoride tooth pastes, fluoridated water, and fluoride treatment at the dental office provide some defense against caries formation. But caries still do form in many cases. Where are cavities most likely to develop on the teeth of your child? On the chewing surfaces of the rear teeth (molars)! Rear teeth are used for chewing. They are more difficult to clean as compared to front teeth because of limited access and visibility. Also, their chewing surfaces are not plain. Rather they have natural pits and fissures which trap food to crush when upper and lower teeth close on each other. The uneven surfaces may not benefit properly from the fluoride treatment also. The pits and fissures may retain particles of food after eating. Even brushing may leave some particles still sticking. Plaque forms, promotes bacteria, which decompose food particles to produce a conducive environment for formation of cavities. To prevent caries formation, dental sealants are usually applied on children’s teeth. The sealants are thin, clear, plastic resin coatings which cover the chewing surfaces of molars and soothe out the pits and fissures. A sealed tooth becomes more resistant to decay. Thus pain and costly treatment later on can be avoided. 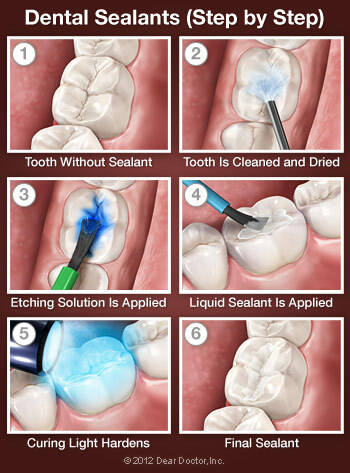 Applying sealants is a very simple and painless procedure. Since children are involved, and they may be scared of any treatment, your child can be assured that it is more like a paint-on procedure which will save him or her from possible drilling later. As enamel has no nerves, a procedure outside the enamel will cause no pain. The procedure starts with a minute examination of the teeth to be sealed. 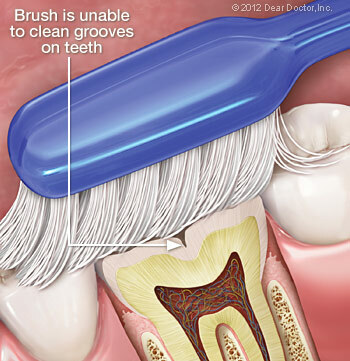 Any minute traces of plaque are removed gently, and the tooth surface cleaned and dried. An ‘etching’ solution is applied which serves to roughen the surface for better adherence of sealants. The tooth is rinsed and dried again. The sealant in the form of a liquid is painted on to the desired surfaces and takes about a minute to harden. A special curing light may be used.That completes the sealing action. Some concern was generated by a report I 2012 that bisphenal-A (BPA) chemical present in some dental sealants in trace amounts might be linked with behavioral problems in children. However, the fears are unfounded. Far more BPA is present in food and beverage packaging, The American Academy of Pediatric Dentistry and the American Dental Association continueto support the use of sealants. Sealed teeth give your child added protection against tooth decay. They require no special care except routine hygiene practice (twice daily brushing and flossing), and regular inspections by the dentist. Sealants should last about ten years, but should be monitored for possible wear and tear during routine inspection visits.